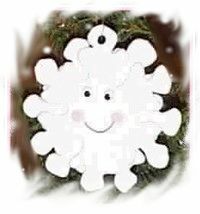 Use our free pattern to make a smiley snowflake to trim your Christmas tree. Print the free smiley snowflake pattern, shown at right, and cut out the pattern. Use this paper snowflake to trace the pattern onto white craft fun foam. Make two identical patterns and cut them both out of the fun foam. Next, place one snowflake over the other, offset so that the points of the snowflakes do not overlap. Check the photo and use this as a guide. Glue the two snowflakes together with tacky craft glue. With the paper punch, make a hole at the top of the snowflake. Glue on two small goggle eyes (or draw your own eyes). Glue on two small pink pompoms for cheeks. If you don’t have any pompoms, you can smudge on a very small amount of pink blush makeup as cheeks, or color lightly with pink paint or crayon. Finish your Smiley Snowflake Christmas Ornament by using a black or red marker to draw on a smile. If you wish, you could also dust on white glitter for added sparkle.